We believe there is a lot to be learnt in the outdoor area. We are very fortunate to have our lovely, rural location which is situated on the expansive Micklands Primary School playing field. 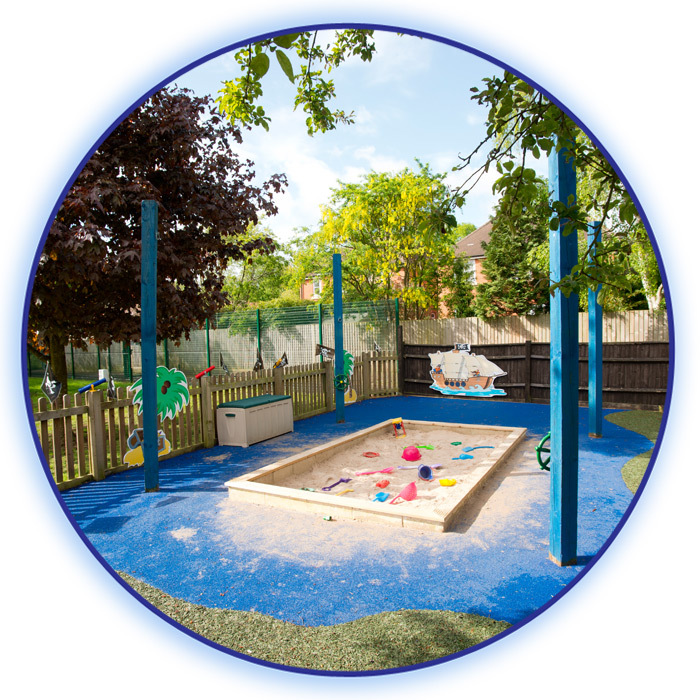 Our large garden is a combination of surfaces including grass, bark, sand, decking and safety flooring. It is surrounded by trees with a copse area close by. It is a haven for lots of little inhabitants such as birds, insects and squirrels. 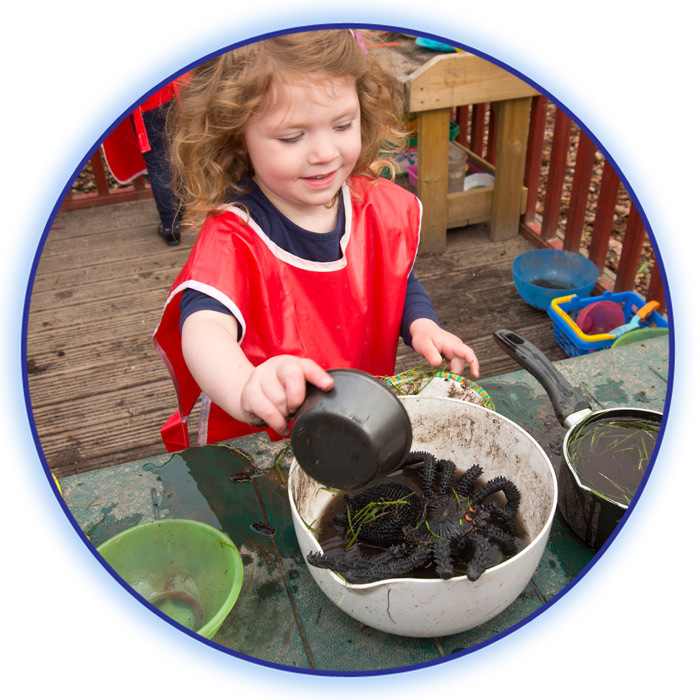 The children like to feed the birds and search for different types of insects in their very own minibeast area! 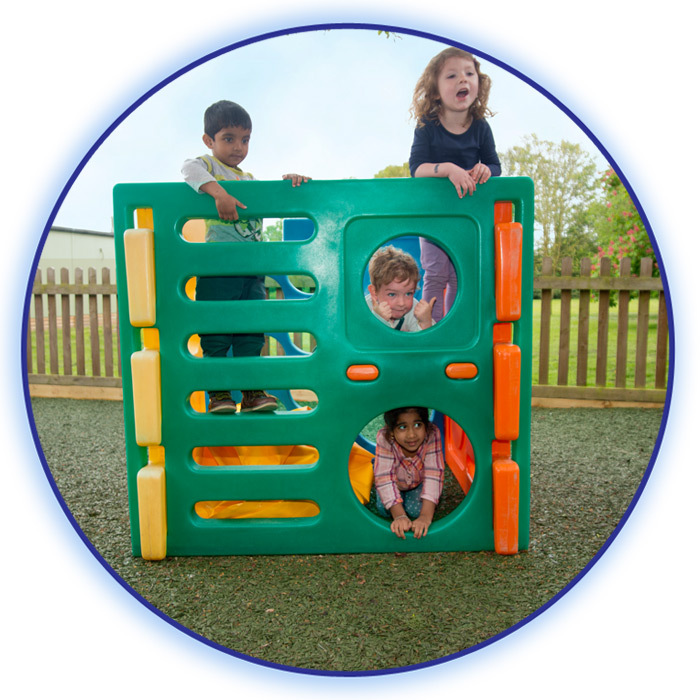 We use our outdoor area for learning and play every day and it is an environment rich in learning opportunities from large climbing equipment that promotes physical development to small dens for hiding and reading. Our vegetable patch is a large raised bed and is home to our beetroot, lettuce, carrots, radishes, potatoes, beans, strawberries and marrows to name but a few! 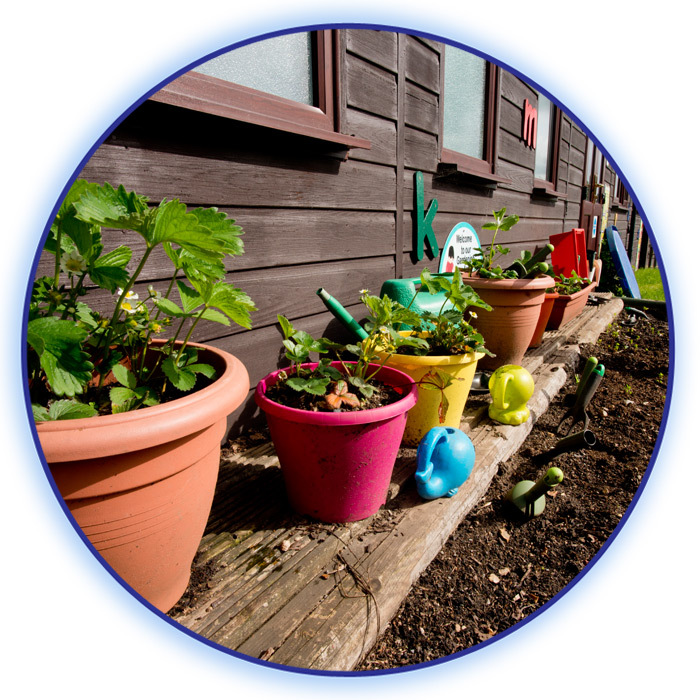 Our practitioners guide the children and encourage them to nurture the plants in this area. Our children’s green fingers have ensured a wonderful crop for the last three years providing an abundance of healthy home grown fruit and vegetables. 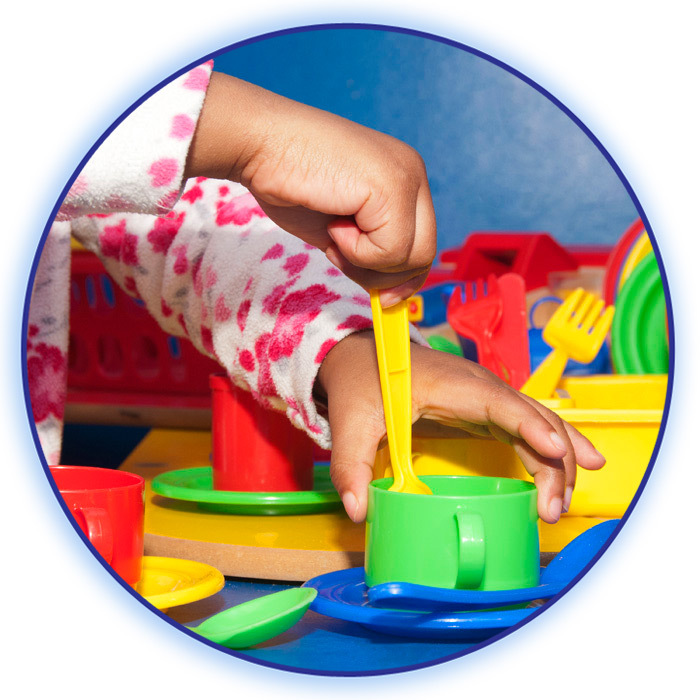 The children and practitioners go on to use these in the kitchen for snack and cooking activities. In October, as part of our annual Harvest Festival celebrations, we take a trip to a local residential home in Emmer Green. We gift our excess crops to the residents and give with a beautiful rendition of our harvest songs. It is an annual event that is really looked forward to by both young and old alike. 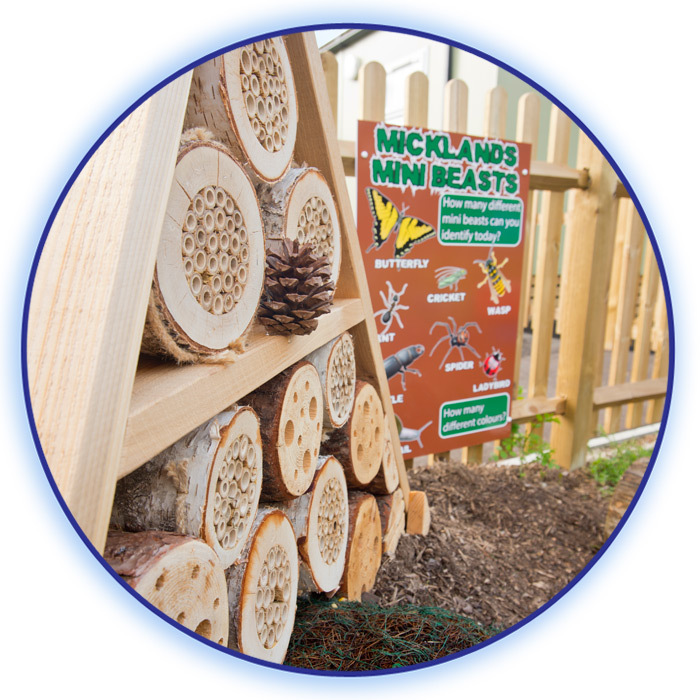 Our “mini beast hotel” is a creature comforts corner designed with both insects and children in mind. The purpose built insect house is set in its own dwelling yet accessible to the children. The natural area of wildlife encourages all types of creatures from ladybugs and ants to grasshoppers and beetles. 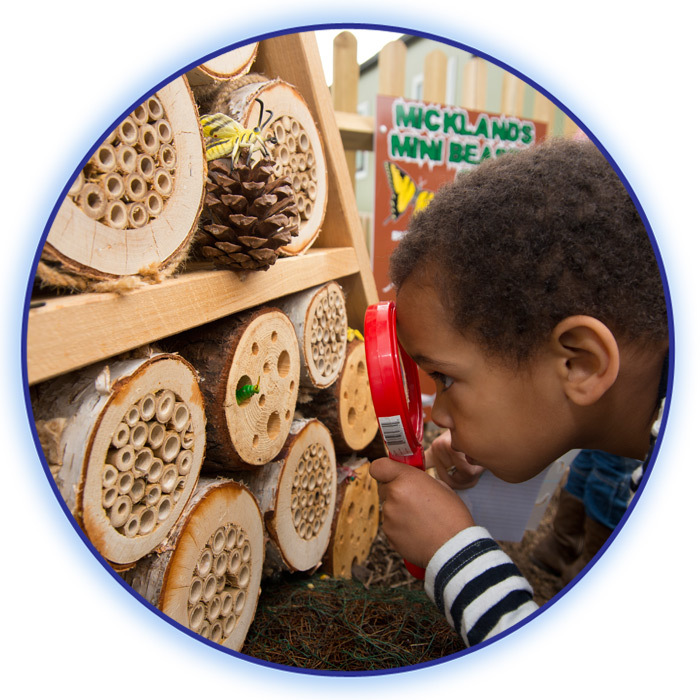 The children are able to get right up close with magnifying glasses to look at the insects, their habitat and their movements. The children observe changes over time and compare different types of mini beasts. 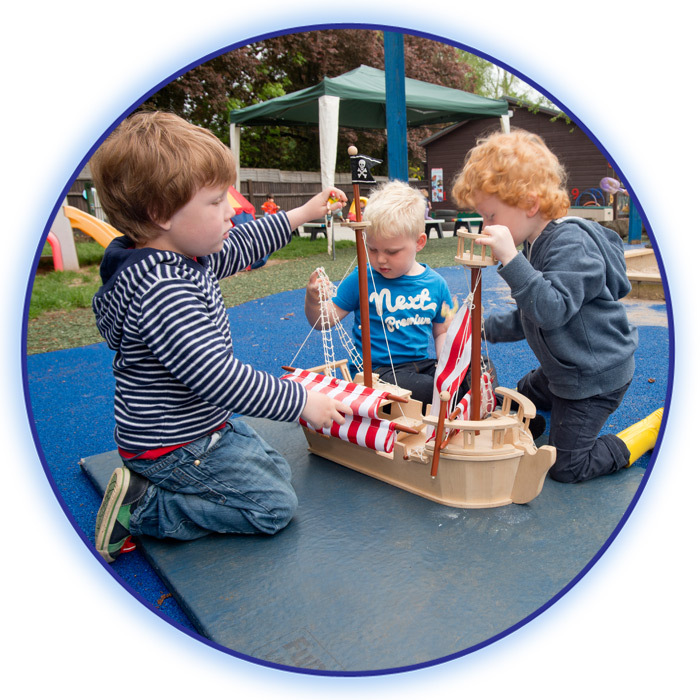 This can then be extended to support their development in all seven areas of learning within the Early Years Foundation Stage. 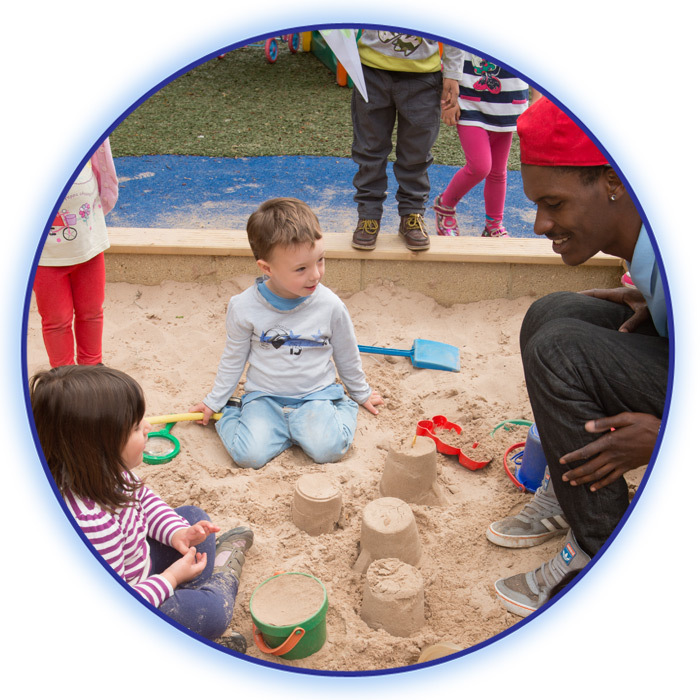 Our sandpit is everyone’s favourite place outside and our skilled staff use it as the back drop to all sorts of activities such as pirate games and treasure hunts to mark making and beach fun! Shaded by a large sail shade in the summer, this area is a cool haven from the warm sun. In winter, when dressed appropriately, the children have great fun, moulding the wet sand into dramatic castles and huge volcanoes!. Our mud kitchen is a small enclosed decked area. This kitchen is built at a child friendly height with large wooden work top areas for the children to mix and stir their culinary delights. 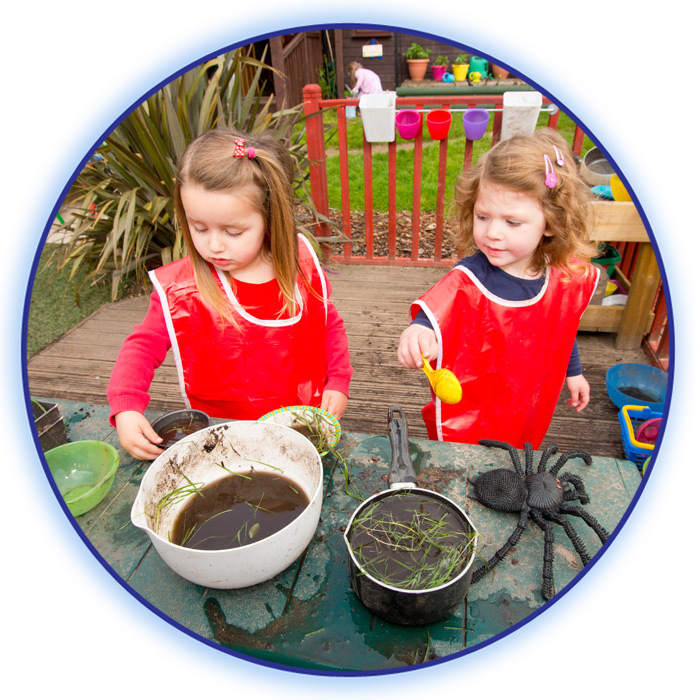 With a wide range of utensils, pots and pans, the children can creat mud pies, dirt soup and a natural milkshake! 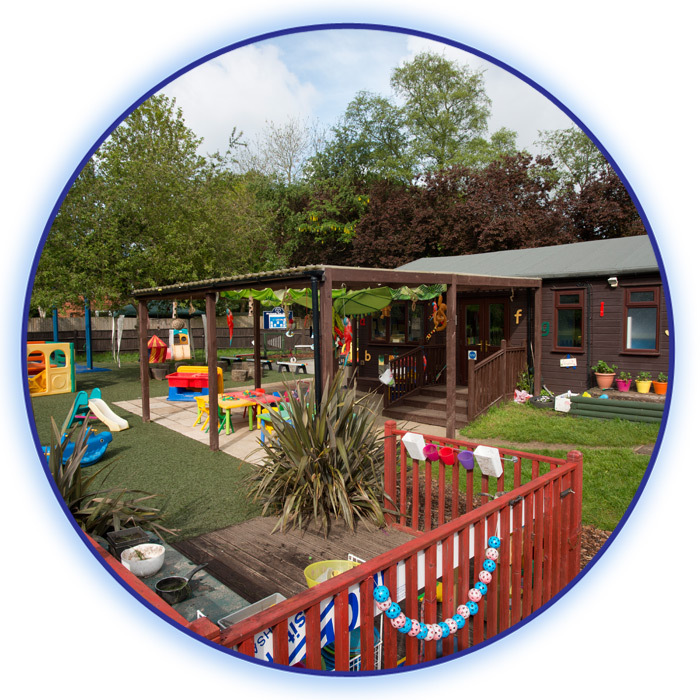 Our outdoor classroom is a sheltered area that leads onto the patio directly from the building. This area is vital in providing a dry area to play and read against the winter elements. Having this covered over area allows us to continue our learning in the fresh air but without getting wet. We use this area to set up marking making activities, painting, and puzzles – all of the activities that would usually be ruined by a down pour of rain! 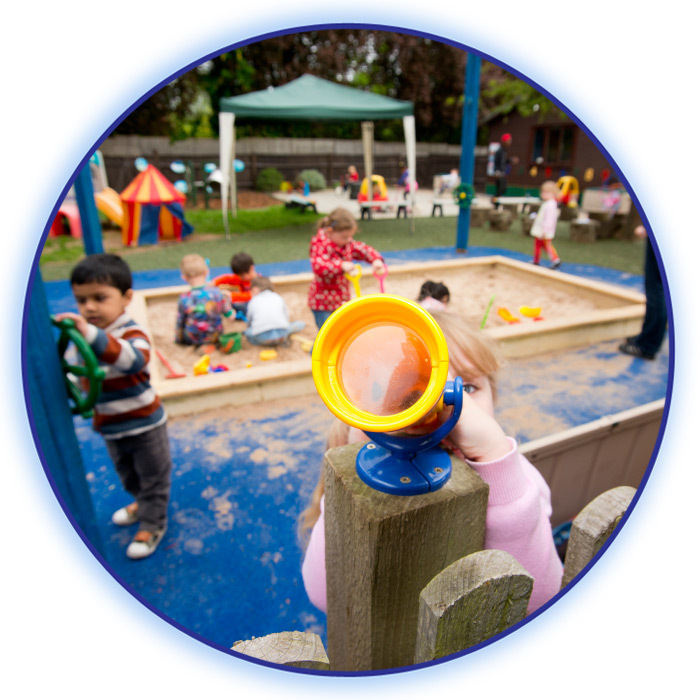 Our indoor play environment is a safe place where children are protected from the elements and are easily supervised. 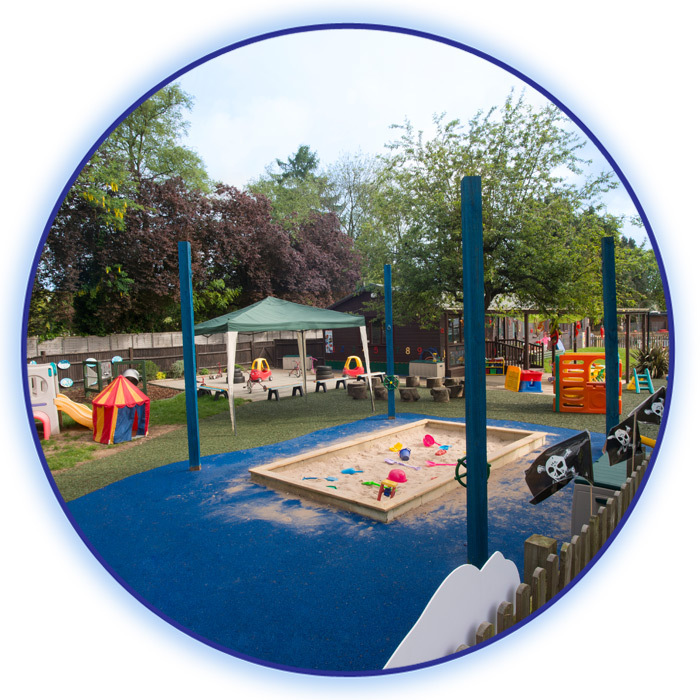 The open layout of our playroom encourages the children to move freely both indoors and outdoors. 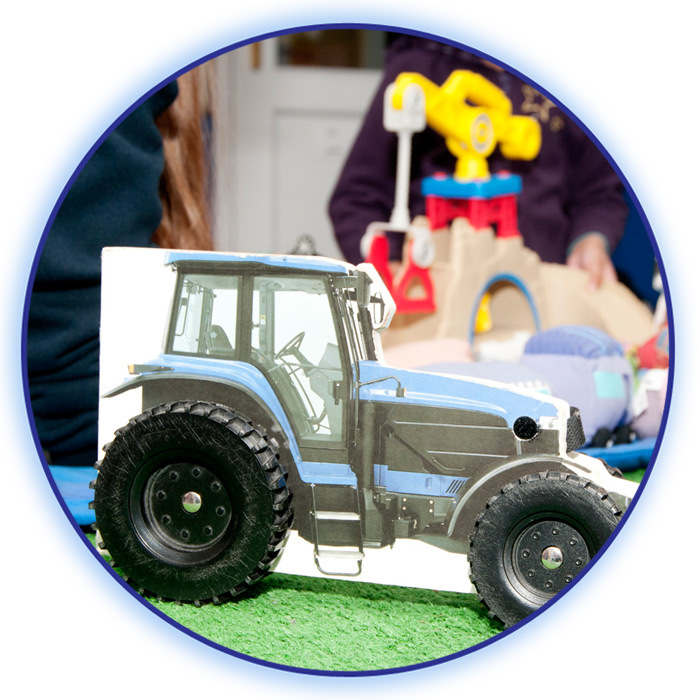 Our large range resources and equipment are clearly labelled with pictures and are easily accessible to the children. 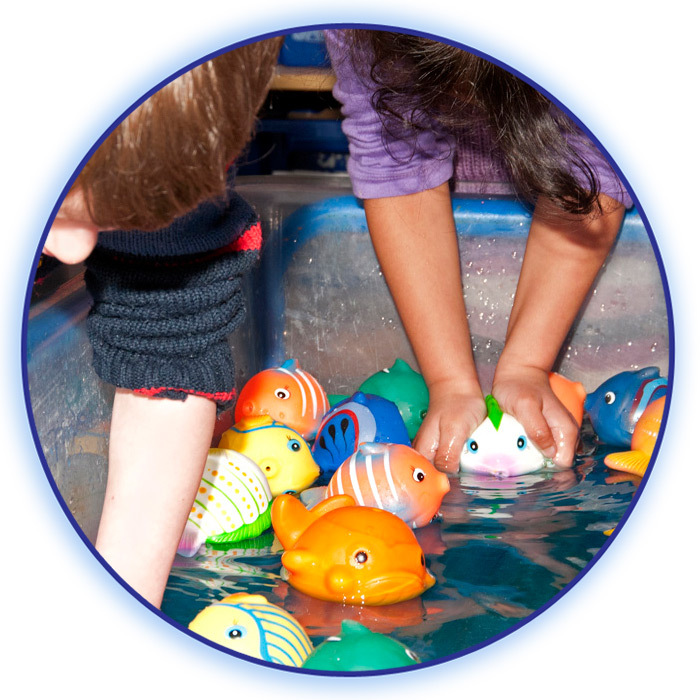 They are picked specifically for their ability to provide variety and promote extended play. 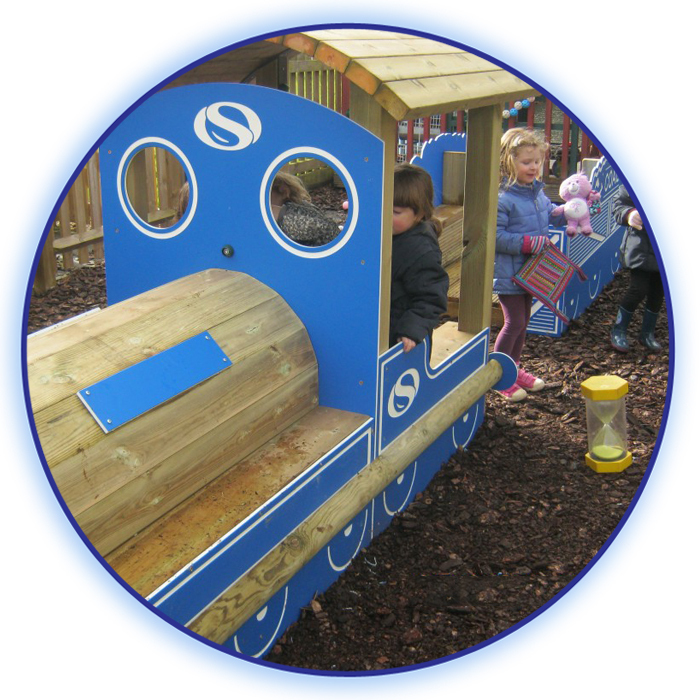 We have a number of well-defined, inviting and colourful areas providing cross-curricular opportunities for learning. These distinct areas help to promote concentration and co-operation. 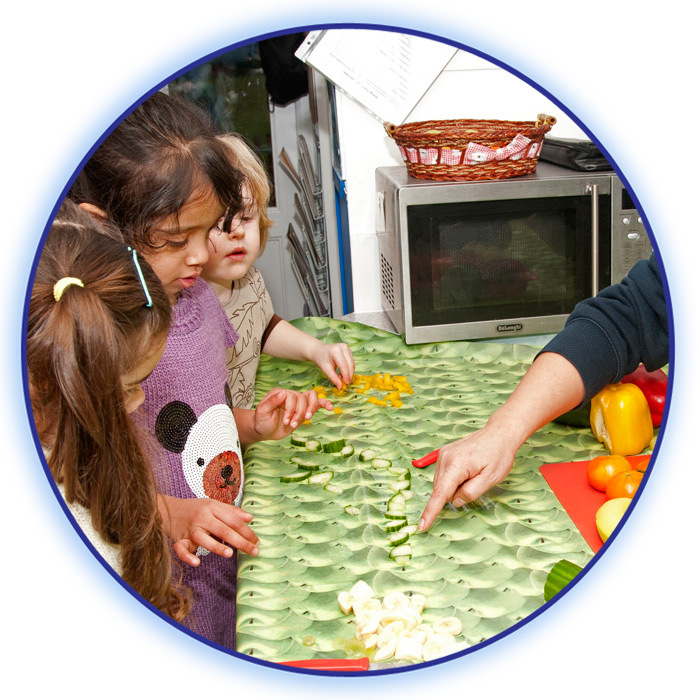 Our accessible kitchen allows the children to become fully involved in all aspects of cooking activities from a safe distance. We use this specifically adapted kitchen area to cook all sorts of dishes from vegetarian curries to fresh pizza, often using ingredients grown in our own vegetable and herb garden. 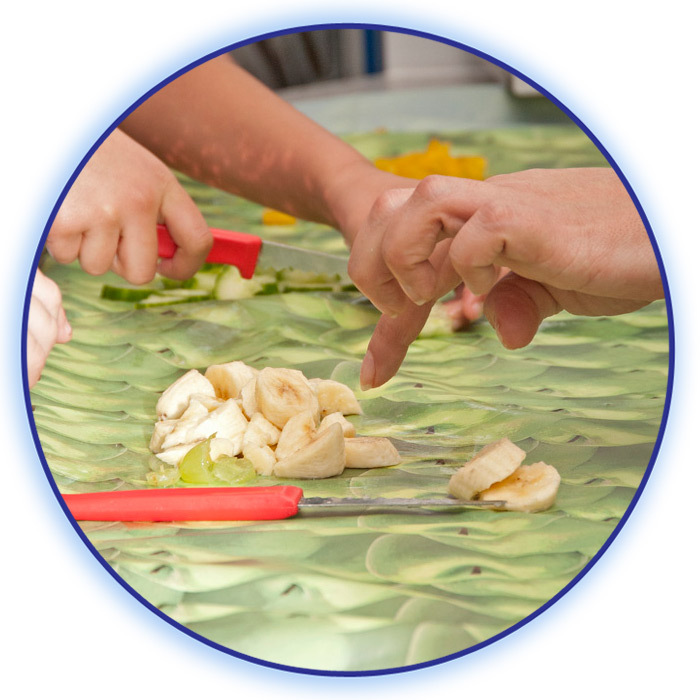 The children’s worktop also doubles up as a snack bar during the pre-school session where they can help to independently select and prepare their own snack. Our maths area is not just about counting. This area is set up to support and encourage problem solving, measuring, comparisons, grouping and basic addition and subtraction. It is rich in numbers and thought provoking activities. Our cosy library area is stocked with a wide variety of literary resources. We have numerous copies of early years classics and social stories. The cushions, sofas, bean bags and soft furnishings provide a relaxing environment where the children can enjoy books together, independently or as part of large group. 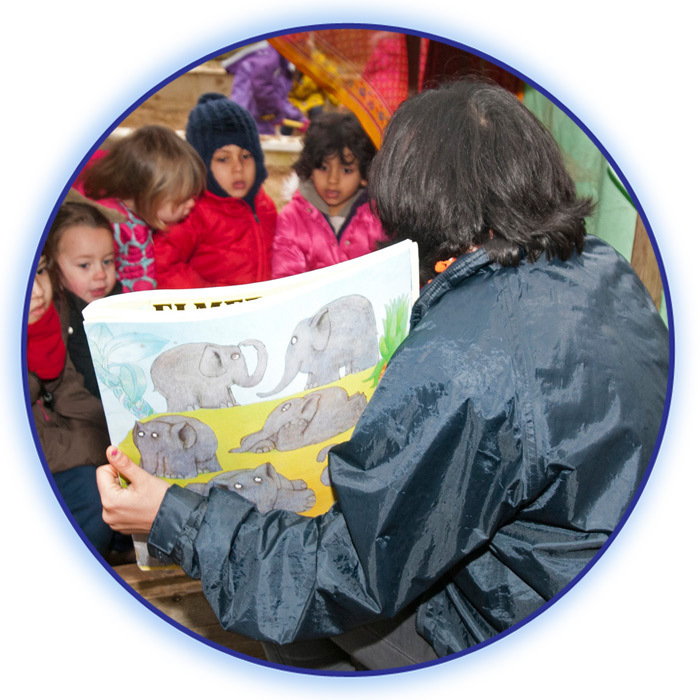 Our library resources don’t stop at familiar stories but extend to books in a number of different languages, Braille, talking stories and stories with props to bring them alive. Our construction area has seen Eiffel Tower replicas, Windsor Castle inspired buildings and complex underground train networks! From Duplo to wooden blocks, Lego and Playmobil, Brio train tracks and junk model boxes, the children use all sorts of resources to build their imaginative creations. This large floor space is an ideal area for intricate design works and large scale buildings to take form. 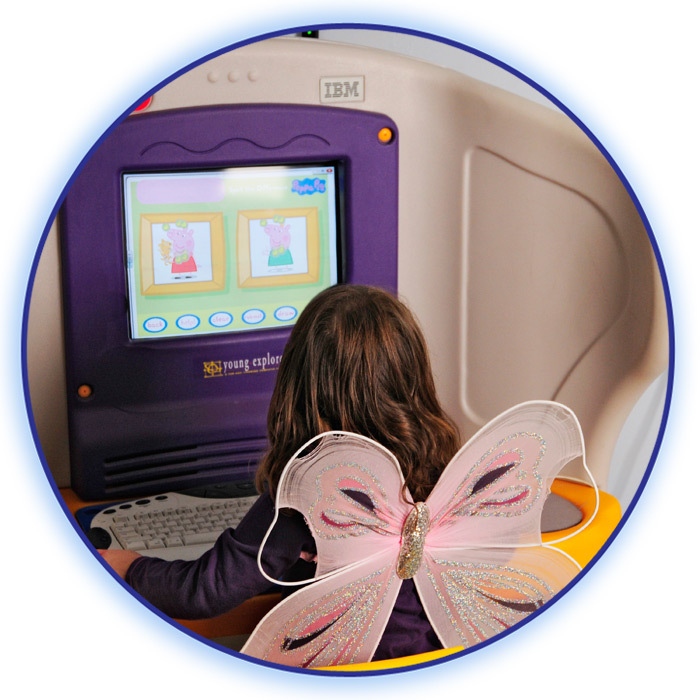 Our technology room is home to a children’s PC and our smartboard. The quieter environment encouraged in this room allows for smaller group work. 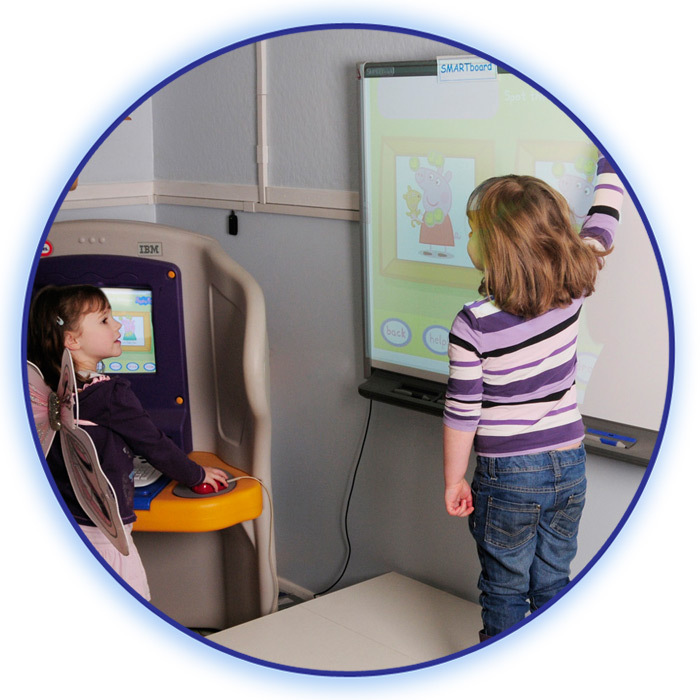 The children are able to work through age appropriate interactive software linked to other areas of learning whilst being guided and supported by our skilled practitioners. Our role play area has been everything from a train station, to a doctor’s surgery, a flower shop, a dentist’s surgery, a builder’s yard and an airport. 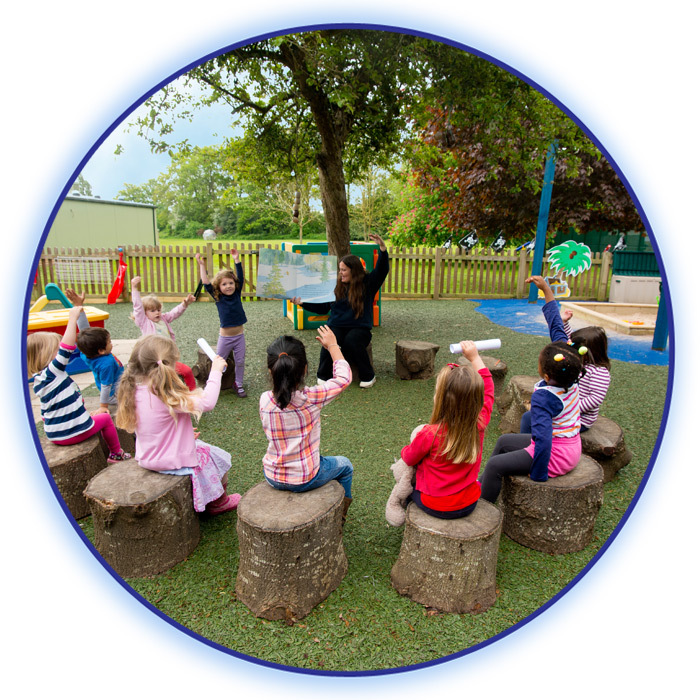 Inspired by the children and facilitated by the practitioners, it is an area where carefully thought out props and backgrounds encourage the children to make believe and become someone else……. 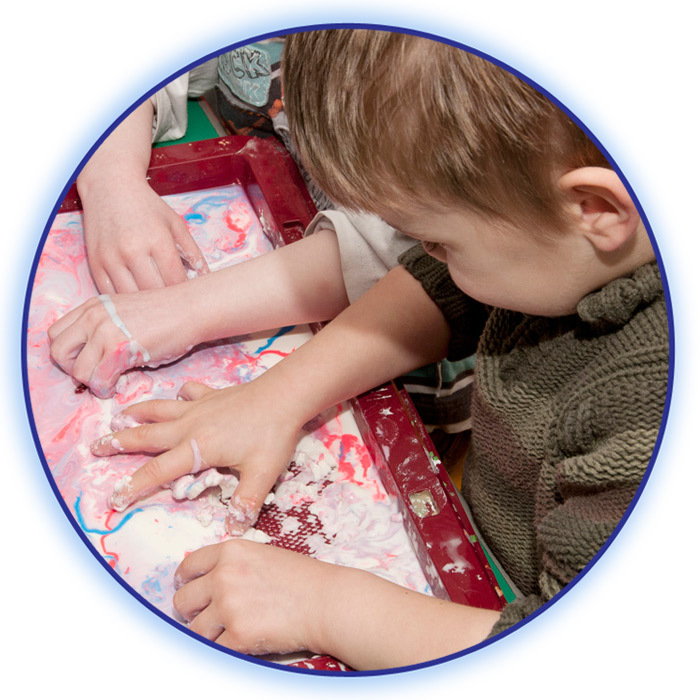 Our creative workshop is designed to be an area of inspiration where children experiment with their creative skills. It is stocked with a large array of media from straws and chalks to material and cotton wool, brushes and pens to charcoals and paints. This area is where rockets are built and necklaces are carefully crafted. The sky is the limit in our workshop! Not all our creative play ends in a finished product. Sometimes we are experiencing and investigating different senses. We may be marking in cornflour gloop or scultping with play dough. We could be making pictures with shaving foam or building with ice blocks. Whatever we create it is guaranteed to be fun though!